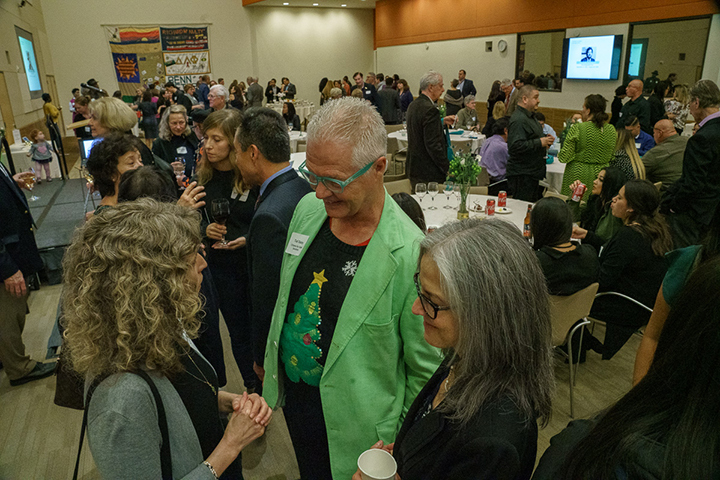 Didn’t make it to Community Partners' annual holiday gathering last week? Well, we missed you and hope you make it next year. We celebrated with close to 200 of our closest friends, project leaders, staff, board members, funder colleagues and more. We bid farewell to three board members whose terms came to an end at the close of this year: Steve Meier, Steve Nissen, and Joy Picus served an impressive 15 years each on the Community Partners Board, and contributed greatly to our growth. A surprise recognition was offered to outgoing Community Partners Vice President Linda Fowells, after 22 years of service to the organization by CEO and founder Paul Vandeventer. And we paid tribute, as we do each year, to our co-founder Al Rodriguez, through the presentation of the Albert. R. Rodriguez Civic Legacy Honors. These accolades serve to recognize the people, partners, and important allies whose spirited dedication to ethical integrity, public accountability, and fiscal prudence reflect Al’s own core values. California Competes is working toward a more equitable system of higher education for all Californians, now under the guiding hand of Dr. Ajose, an expert in urban labor markets and higher education policy who currently serves as chair of the California Student Aid Commission. “Being here at Community Partners is what allows us to focus on our work, going around the state and talking to students, talking to administrators” and others, Dr. Ajose told the crowd. “I started this work because I was shocked and appalled to see young people living and dying on our streets,” said Alison Hurst. That was in 2011, when she started taking care packages with friends around to homeless youth in Venice. Today SPY has a budget of almost $3M, a new building for their drop-in center, a staff of 38, and a volunteer force of 454.